New year, new life, new style! At the end of each year those of us concerned with style and colors are always curious to know about new directions to take for the coming year, whether it would be for a remaking of a space, a remodeling of a house, or presenting a personal image. It is a genuine need we have to feel and look good first and to please others second. The first decade of this millennium has been characterized by bluish colors, from indigo to plum, in all the tints and tones. We are leaving the blues to dive into the pinkish, in fact Pantone has declared Honeysuckle the color of the coming 2011. Honeysuckle is a hot and vibrant color, but many, I am one of them, might not feel too hot in this color. This color is considered an “escape from reality” and a boost to our self-esteem in facing everyday problems and life challenges. This is all good, if a simple slap of honeysuckle color on the walls really helps people keeping their sanity!!!! We all know that in time of stress every little cheerful thing helps. During the depression the colorful glasses were invented and the pink glass was the color most in demand then. The Federal glass today are highly collectible and valuable. In decorating a room, honeysuckle will help the decor come alive without overpowering the rest of the décor, but only if it is used on one wall (Photo from: Oprah) or when used in a bunch of pillows and nothing else, or even when used on draperies alone. Honeysuckle emanates a great energy around food areas, such as kitchen, dining and family rooms. It has been said it is a powerful color to increase appetite and feed conversation, just like the red and orange colors. To add a rhythm to a white kitchen, it is a good idea to paint and accentuate some cabinets in honeysuckle. In the same color, paint wood door knobs/handles and attach them to the white cabinets, then attach Federal pink glass knobs to the honeysuckle cabinets. Now that’s rhythm! I just gave you a solution for an innovative make-over kitchen without spending a boat load of money. Colorful pillows create a fresh young atmosphere in a house, a few here and there in honeysuckle color can be the base for the dominating field which communicates with some pillows in light green, beige/brown, white and even red. 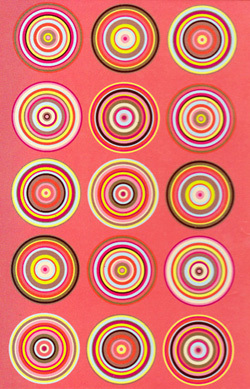 Use my palette of circles (above) as a guide for home and fashion. I am ready to fit this new 2011 color in my life. Are you ready to have a striking vibration and a new level of energy this coming year in your home or guard robe?